Dog owners know that their furry friends offer unparalleled companionship. A growing body of research shows they also do much more. 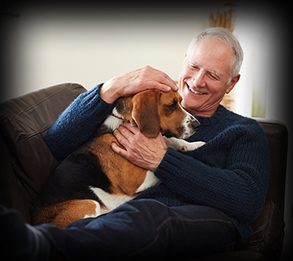 Owning a dog can prompt you to be more physically active—have leash, will walk.This Special Health Report, Get Healthy, Get a Dog: The health benefits of canine companionship, shows how having a dog can also reduce feelings of isolation and loneliness, help calm jagged nerves, and improve the lives of older individuals. Just petting a dog can lower the petter's blood pressure and heart rate (while having a positive effect on the dog as well). Just petting a dog can reduce the petter's blood pressure and heart rate (while having a positive effect on the dog as well). 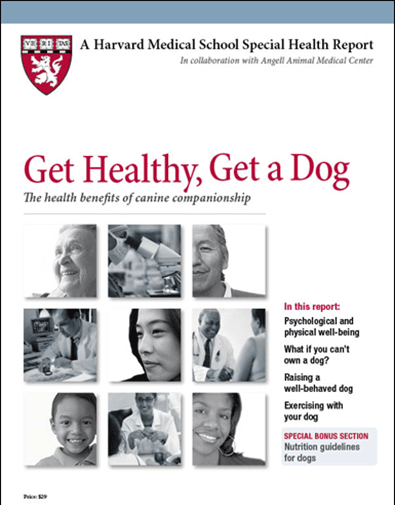 Get Healthy, Get a Dog, a new Special Health Report from Harvard Medical School, details the many ways that dogs can improve the lives of humans. The health connection is often a two-way street. People who are overweight and sedentary tend to have dogs that are overweight and sedentary. In fact, obesity has reached epidemic proportions in the canine community — affecting more than half of dogs — just as it has among humans. So if you have an unhealthy, overweight dog, that may be a red flag that you’re unhealthy yourself. Get Healthy, Get a Dog offers healthy lifestyle changes for both you and your dog to further boost the benefits described above. If the two of you already exercise together, it offers ways to expand your activities. If you don’t own a dog but would like to adopt one, Get Healthy, Get a Dog guides you in choosing a companion that will suit your lifestyle. It also covers the role of service dogs in the lives of humans and ways to benefit from contact with canines if you don’t own a dog. It also includes a special section on optimal dog nutrition, plus a chapter on exercise, so you know exactly what your dog needs to stay healthy and fit. Although dogs are wonderful motivators for getting moving, they are not just a means to a healthier end. Adopting a dog is a commitment that will last for many years, and you must be ready and willing to take on that responsibility. If you do, it’s likely you will be richly rewarded with one of the most satisfying, loving, and active relationships you’ll ever experience. Perhaps one of the greatest psychological benefits of interacting with a dog is the opportunity it provides to be more mindful—to purposely focus your attention on the present moment. Mindfulness has garnered tremendous interest over the past decade because of research indicating the practice reduces stress and enhances health. Mindfulness is the opposite of multitasking. It has its roots in Buddhist practices and teaches us to live each moment as it unfolds but without judging what we are feeling and perceiving. It involves erasing the past and future from your mind. The practice is a component of many relaxation techniques, including yoga, deep breathing, tai chi, massage, reflexology, journaling, and prayer. You can also easily use the technique to reduce stress while walking with a dog. In fact, let the dog show you how. Notice how joyously present she is when walking out in the world: her headis up, her tail is wagging, she’s alert and taking it all in.She is open to new sights, smells, sounds, people, and animals. Each walk is viewed as an adventure. • As you start your walk, take a moment to bring your attention to the sensations in your body. • Breathe in through your nose. Let your abdomen expand fully. Then breathe out through your mouth. Notice the sensations of each inhalation and exhalation. • As you continue to walk, engage your senses fully. Notice each sight, touch, and sound so that you savor every sensation. Mindfulness is a lifelong practice that can help you to better appreciate simple everyday experiences like being physically active with your dog. By learning to focus on the here and now, you may find yourself less likely to get caught up in worries about the future or regrets over the past (emotions your dog never feels).How human contact benefits dogs. People aren’t the only ones who stand to gain from their relationships with dogs. The dogs do, too. As domesticated, social animals, dogs have been bred for centuries to be dependent on humans, to beat tuned to their behavior, and to love them. A dog maybe a man’s or woman’s best friend, but often a person is a dog’s best friend in return. Research conducted with shelter animals, which tend to be anxious because of their social isolation and unfamiliar surroundings, show that human contact lowers their stress level, helping to calm them and make them more adoptable. In a study of 100-plus adult dogs housed at a Colorado shelter, one group of dogs was released from their kennels for 45 minutes a day and taken for walks or to play or be groomed, petted, or taken through basic dog obedience exercises, while another group was designated as a no-contact group and left in their runs or cages. The dogs that interacted with humans soon after their arrival at the shelter were found to have lower levels of the stress hormone cortisol in their saliva. The effect was noted across all breeds and ages and both genders. Another study found a similar benefit on cortisol levels for dogs as well as better scores on behavior tests with just 25 minutes of exercise and human contact a day.